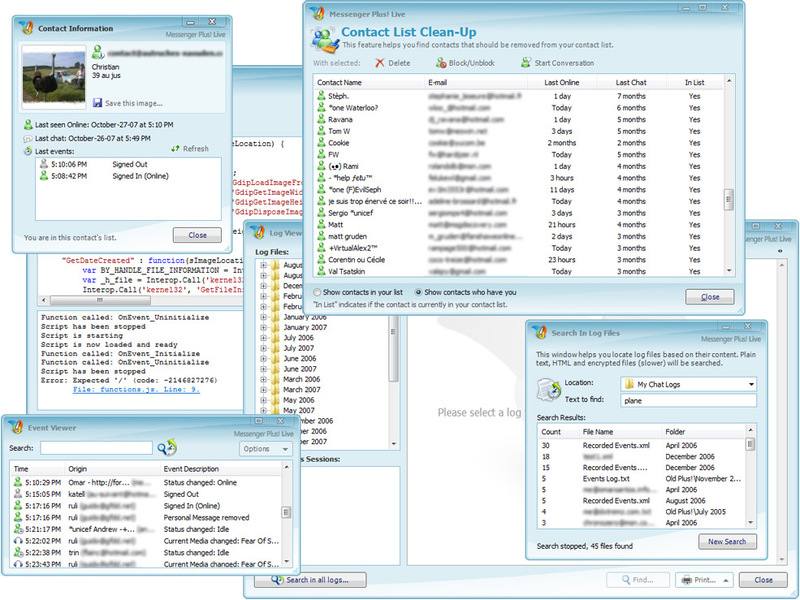 Windows Live Messenger 9, new Mac OS X client, API examples, etc. "Internal builds are already at Windows Live Messenger 9 and include many of the API components. They have a team working on multi-person audio/video chat that may or may not be in WLM 9, but should be in by WLM 10. They are also trying to work out a way for WLM users to chat with AIM/GTalk/ICQ users like the way Yahoo! works now, and they have an internal version that works with GTalk already (but very basic)." "MS will no longer update the MSN Messenger for Mac, but they are going to release a brand new client for Mac OS X that is according to Andrew Jenks "Really, really cool and awesome" but he would not provide anymore details due to his NDA." - A Vista Sidebar gadget that showed a single contact and their status. Double clicking on it opened up a chat, dragging text, images, or files to the gadget automatically started a file transfer or sent the text. - Servers "talking" to administrators: a server linked with the API would alert the admin through Windows Live Messenger and by cell phone text message whenever the hard disk space was low. - An application that showed exactly where all of your contacts are in the world, using some of the abilities of the API and the information provided by your contacts. - Messenger Lite, a recreation of Windows Live Messenger in only a little over 400 lines of code, with full chat/nudge/file transfer support between this and the real version of WLM. To conclude, AmpCoder also made note of the facts that a newer version of the Server API will be released soon, that the Windows Live Messenger integrated into the Xbox Live platform is version 7, and that they are currently working on upgrading that to WLM 8.5 and possibly even 9. >> Play Big Monster Battle against one of your contacts via our MSN Games Launcher (scroll a bit down in the list). >> Copy-paste (•̪●) into your nickname or personal status message for a little skull symbol (thanks for that, Rolando). >> Our selection of hair-raising Halloween Emoticons & Display Pictures. >> Use our speech bubble maker to recreate dialogues from your favorite scary movies. Here's our fifth and probably last Halloween treat for this year: a free theme pack with no less than 30 animated Halloween season emoticons, 1 ghost wink, 2 dynamic display pictures (one with sound) and 2 conversation window backgrounds. >> Download the Halloween Theme Pack for Windows Live Messenger. 2. Untick the three options if you don't want to mess with your default settings. 3. Click "Agree" and let the zombies in! NOTE: Once the installation is finished, a browser window will be opened with a Live Search for the keyword "Halloween". Hundreds of you have already installed the Big Halloween Pumpkin Emoticons which I added to CustoMess on Monday, but since I also have the bigger versions of these designs by Icons-Land, I decided to add them as a Display Picture pack too. >> Instantly add the ten Big Halloween Pumpkin Display Pics using CustoMess. >> Collect all Glow in the Dark Monsters. >> Buy the t-shirt before the stock runs out. >> Browse all 196 Horror Display Pictures. Neowinian AmpCoder reported about an event at the Georgia Institute of Technology yesterday, at which Microsoft disclosed their current status on a more advanced Windows Live Messenger API. The improved API will allow third party developers (like many among you) to create everything from gadgets or addons that integrate the features of Windows Live Messenger, to a personal (eg. light) version of Windows Live Messenger. The demonstration at Georgia Tech showed a very basic API, but, unlike the currently available underdeveloped API, they aim for full support of all Messenger features, including audio/visual protocols. A Tech Preview is expected to be released at the MIX08 conference in March 2008, and then a first beta will follow later that year. If everything goes according to plan, Windows Live Messenger 9 will support the API when it is released in late 2008 or early 2009. Sorry for the few hours of downtime tonight. It was entirely our own fault, no Halloween spirits were involved. Big thanks to Chris for alerting me that something went wrong. 1. Download (direct link) and start emoticons.exe. 3. Untick both "Usa Live Search..." and "Imposta MSN come..." if you don't want it to mess with your default search and homepage. 4. Click "Accetto" and the rest will be taken care of! >> Grab them from "Sei pornto per la notte di Halloween?" >> Also check out our own Halloween Special page with free emoticons and (some very gross) display pictures. While we're counting down the days to the final release of Windows Live Messenger 8.5 (soon, my friends, soon...), Yahoo! has just released the beta-version of Yahoo! Messenger 9.0 to the public. Sporting a whole new look and feel, the redesigned contact list borrows from the detailed one in Windows Live Messenger with its multi-line contact information and emoticon-supporting statuses, a contact search bar (similar to our "word wheel"), and the display of large avatars. However, the new version of the fellow IM application adds some enviable features too, like integration with that other Yahoo! property, Flickr.com, for easy photosharing and -saving. Even better is the in-line media player, which allows you to share videos from eg. YouTube or Google Video by pasting the link inside the conversation window. A video player will automatically be embedded into the conversation, so you don't have to open a new browser window. The same works with photo links and even online maps which can be zoomed and scrolled! Lastly, there are several new emoticons for expressions like "thumbs up," "thumbs down" and "rock on", all inspired by the winners of the 2007 Emoticontest. For more than a year now, Windows Live Messenger and Yahoo! Messenger interoperate, which means users of both programs can interact across the networks. Interaction is currently restricted to text, basic emoticons and nudging (or "buzzing", as it is called in Yahoo! Messenger). >> Download Yahoo! Messenger 9.0 Beta. >> More info about Yahoo! Messenger 9.0 Beta on the Yahoo! Messenger Blog. PS: The video from the screenshot is the amazing Bollywood version of Michael Jackson's Thriller. A must-see! Halloween goodie #1: Big Pumpkin Emoticons! The night of October 31st is nigh so here's our first Halloween goodie: 10 biiiig, high-quality Jack-o'-lantern emoticons kindly provided to us by Taras Berezyuk from Icons-Land. As usual, you can add them to MSN/Windows Live Messenger quickly and automatically using our free CustoMess software and their standard keyboard shortcuts are *hw0 to *hw9. >> Download the latest version of CustoMess directly here or from Download.com (safe and spyware free!). At the start of this month, Patchou announced Messenger Plus! Live 4.50, a major refresh and the most important update since version 4.00. Back then, Patchou added that screenshots would be published later in October and to suit the action to the word, he sent us a collage revealing some results of the five months of hard work he put into version 4.50. >> Preview screenshot of Messenger Plus! Live 4.50. As you can see, it visually blends into Windows Live Messenger 8.5 perfectly, has more advanced chat log searching, and improves the tools for script developers. Expect additional information about the new version on the Messenger Plus! Live homepage soon.